Halwani has just finished university for the day when we catch up, his English carrying more than the hint of a French accent. On occasion he talks 19 to the dozen, such is his passion for graffiti, calligraphy and the reclamation of Beirut’s streets from the clutches of the city’s myriad political parties. For an alternative voice, he is both endearing and charismatic. Following a brief misunderstanding in February this year, the possibility that much of his work – and that of other graffiti artists – would be removed by Beirut Municipality has receded, leaving him free to plan a spring and summer offensive on the city’s battered and bruised urban landscape. He’s also free to continue to replace the imagery of political propaganda that plagues Beirut with more inspirational cultural icons. “This is the main objective behind my work. To try and loosen the political grip,” he says. “That is why I paint Fairuz or Mahmoud Darwish or Ali Abdullah, the homeless man who used to live on Bliss Street. Because for me these are the true faces of Beirut and with whom Beirutis should identify. The true figures of our society should not be political, but rather cultural or artistic. “Well, they have weapons and political parties are particularly territorial, so if you do something they feel is loosening their control they can get angry, and they have the upper hand. You have to know how to navigate by just talking to them; tell them that what you’re doing is not there to replace them, although for me personally that is what I’m trying to do. Originally a traditional tagger, Halwani has embraced calligraffiti, merging Arabic calligraphy with graffiti art, and has sought to create murals that solidify the link between the people of Beirut, their culture and the Arabic language. 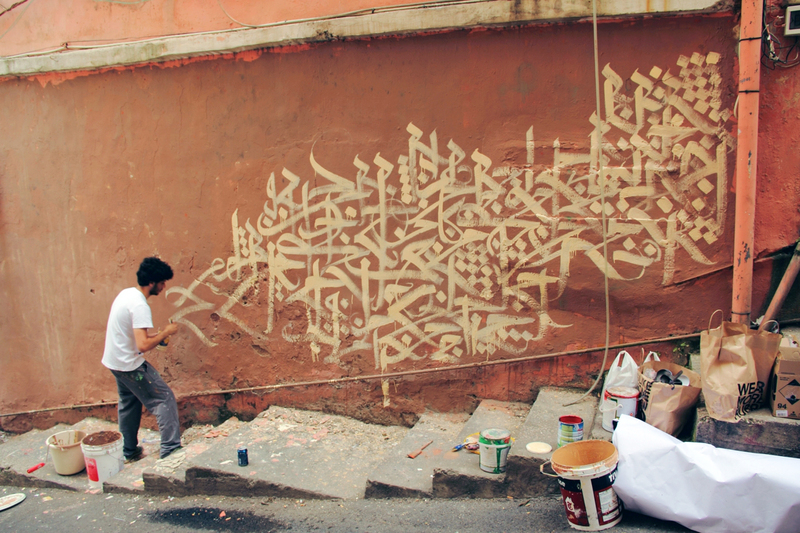 His style incorporates Kufi (an angular script that is made up of short square and horizontal strokes), Diwani (a complex cursive style of Arabic calligraphy) and Thuluth (a cursive script designed with curved and oblique lines), while his process of creation utilises numerous techniques. These include stencilling, the use of string and chalk for certain geometric patterns, brushes and acrylic paint for calligraphy, and spray paint for the portraits themselves. He also incorporates calligraphy into faces as a means of shading, with the words relaying messages. For example, the Darwish mural included the quote ‘On this Land, there’s what’s worth living for’. It is easy to detect a sense of responsibility towards public spaces when talking to Halwani. No doubt other Beirut street artists feel the same way, including Ali Rafei and twins Mohamed and Omar Kabbani, who go under the name Ashekman. He often removes posters before doing his work, and one of the successes of the Fairuz mural was its integration into the buildings around it. It sits well not only with the colours of the streets, but with the architecture of the building itself. Interestingly, Halwani sometimes views himself as politically incorrect, inasmuch that he attempts to beautify the city without taking permission, whereas everybody else destroys the city without taking permission. In a sense, those who believe he is wasting his money have a point. Graffiti is not cheap for an artist to produce. As such, Halwani has delved into the commercial world, creating work for galleries and art fairs, as well as individual commissioned pieces for private collectors. His mixed media work on canvas of the iconic Syrian singer Asmahan, produced for the 2013 Beirut Art Fair, is an example of the kind of sought-after work he produces, although it is possible to level criticism at a graffiti artist who moves from the street to the gallery. “When you work on canvas it’s not like working on a wall,” he says. “It’s a different media, it’s a different challenge, but it’s also a challenge and this is the most important aspect. For me it makes sense for several reasons. The type of graffiti that I do, in Lebanon especially, and in the cultural context, is no longer a kind of anti-system thing, it’s more about graffiti for the people. Street art has an ephemeral nature, so I see canvases as several things. The first one is the concept of creating work that is not going to disappear. It’s like taking a picture to save my work, because in the street it might get destroyed, it might get painted over, it might fade away. Canvases are snapshots of the graffiti I do. The third reason cited by Halwani is the challenge of creating work that will be critiqued. “If you want to develop your style as an artist and be criticised and make sure that what you’re giving to the streets is the best thing you can do, you have to go to a gallery and be criticised,” he says. Either way, his work has moved far beyond the early days of tagging. His creative process is hectic. He sketches, reads Arabic poetry, listens to the news, uses public transport wherever possible, and walks. Walks a lot. Mainly to identify potential walls for future work. And there’s no trouble with the law? So what happened with Beirut Municipality back in February? So Beirut largely tolerates graffiti? “…responsibility towards public places..”is a concept that makes Halwany stand out. Graffiti in most cities/countries have an aggressive edge that isn’t balanced out by a sense of the surrounding aesthetics. Colours generally clash. The second picture in this post is art. Nice to read a real-life story of beauty, hope, and change instead of stories bound by anger and hatred and inequality. Thank you! This a very relevant and hopeful piece about a tagger in Beirut who is doing a whole lot more than spraying paint on walls – he is giving back a cultural focus to his community by replacing political posters with portraits of real local people combined with three different types of Arabic calligraphy to create a beautiful melange of what it means to be human in Beirut. This is what good art is supposed to do! He even has a pass from the local government, who will leave his existing pieces alone, and allow him to create more without fear of reprisal. Read the story below, for something exciting and hopeful. The third reason cited by Halwani is the challenge of creating work that will be critiqued. A really great photo and I like the writting. Don’t underestimate the power of Hip-Hop culture. Graffiti is one of the elements of the culture. Keep it right, keep it real. Peace, love and unity. That certainly is the writing on the wall! True.Despots and dictators do this. So to an unjust political stystem, grafitti is a bit of an artistic revolt of sorts. Maybe not and end to freedom but a means where it is sped up. One of a kind for expression art ! Such powerful images. Loved your post! Great stuff all round. Congrats. I didn’t read the whole story…..I was screaming in the inside with where have you all been…. then I see not America. Graffiti in the U.S.A has been around for years. I’m 34 years old and I remember it was a former of punishment to young adults to go around and remove graffiti from our neighborhoods. Graffiti to me cause I can only go back to when I was a kid. In the early 1990’s late 80’s. But street gangs would use it to display the rights to their territories. Then once police brutality became public it was a way to express pain for losing a member of the gang. If you go to Okland California it all over. Small neighborhood liquor stores, and other small local business owners from other countries like such in this article would allow the kids from gangs to use graffiti on their buildings as a peace treaty so they wouldn’t get robbed or beaten! I’m glad to see its more commonly used now! It’s a true Pacaso! !!!!! Thanks for sharing. ………follow my blog as I will do the same for you!!!!! I have a friend who is an artist and she was hired to work with Inner city youth. They had a great time; the only that seemed odd is that the work they did that they were all happy with was located at a place of the interstate, which is all good, but, the first thing I thought was that like the artist said. It may not change anything, but it would make a difference to some; if they could have an In house artist in all public inner city schools of all ages to have a building in their neighborhood to paint. Yes, the gang members would destroy it, yet one or two may cross over, but it would done with idea that each time, it was destroyed it would be repainted. but would have to a commitment from the city, to keep the police out of it. It would keep the violent youth busy.